Famous for working with various types of electronics, including calculators, dictionaries and electronic agendas, Casio is also well known for their watches. However, the company appears to have decided to enter the wave of smartwatches themselves and decided to bet in a solution made to please a more conservative audience: the traditional apparatus with some intelligent capabilities. In this line, the company continued developing its G-SHOCK watches – including the GBA-400 GMIX model, which you can see at this link – and other products that unite the classic devices to technological functions. Now, the Japanese manufacturer brought to Brazil the Casio Edifice Time Traveller EQB-510, you can submit features connected even without relying on digital displays. Endowed with Bluetooth connection, the appliance can connect to smartphones to offer more advanced features than an ordinary analog clock, at the same time that features a visual luxury and sobriety of a classic device. But does the Casio Edifice has managed to develop a device whose duties make it count the 2,989 R$ charged for it? Check out our review in this analysis. The EQB-510 makes clear what your target audience in the appearance of your packaging, a well-crafted box made of a material that resembles leather, which gives the product the same elegance in a jewel. To open it, we can see the clock resting so majestic about a light pad also made of a material similar to leather – all to ensure that the appliance will reach your own with all the protection and refinement needed. As for the design of the product itself, it is undeniable that the EQB-510 has all the characteristics of an analog clock. The finishing of the pointers and details of the display until your stainless steel body, the device does not owe anything to the classic and stylish appliances look – something that certainly is a major concern for executives and others demanding as to style. When contacting the EQB-510 for the first time, it is possible that an unsuspecting user confuse with a common analog clock that just has some pointers to indicate such things as the day of the week. However, the device offers some functions that we imagine to be hardly see out of a digital watch or a smartwatch clock, as an alarm that rings daily and even a stopwatch like LG G Watch R.
To access each of these functions, simply click the upper-left corner of the device. To find out which function is being displayed at the moment, we need to keep an eye on the pointer that, when in clock mode, shows the day of the week. If you are in the timer mode, the pointer will be returned to the letters ST, and when viewing the alarm time he points to AL. Once in the timer mode, just hold the button top right of the appliance so that the second hand begins to move to record the passage of time. Every minute and hour elapsed since the activation of the count are displayed in secondary indicators located in the display reduced on the right side. To reset the count, you need to just stop it by pressing the upper right button and then press the bottom right. Entering the alarm mode, you can notice that the secondary dial pointers right quickly move to a position to indicate in which your time clock is programmed to play. In this function, you can enable or disable the alert by pressing the upper right button – the current status of the alarm will be pointed to by the pointer of seconds, which is turned to ON or OFF. To manually change the time at which the alarm will ring, you need to pull the PIN on the right side once and rotate it until the indicators are focused on the hour and the minute you want – however, this task becomes easier when using Bluetooth. As much as the classic look and stylish the EQB-510 is certainly attractive, it is only when we use your connectivity via Bluetooth to connect it to a smartphone that the biggest product differentials become evident. 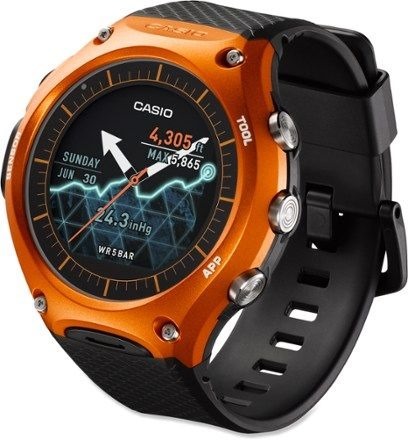 Before making this connection, however, you need to download and install on your phone the Casio Watch + app, available for Android and iOS-click respectively here or here to download. After you open the application, choose the EQB-510 model and make sure that Bluetooth is enabled on your smartphone to allow it to communicate with the clock. To activate the communication on product from Casio Edifice, just hold the lower left button until two short beeps are emitted. Once the devices are connected to each other, the second hand passes the point to the blue Bluetooth symbol on the display. To disconnect the clock, for your time, users can either hold the lower left button again as to enable “airplane mode” the EQB-510, which can be done by holding the top left button for 5 seconds. A high beep and the movement of the pointer of the day of the week for the design of the plane will indicate that all communications of the appliance have been disrupted. Since EQB-510 is connected to your smartphone, you can use the Casio Watch + app to check out the other features of the product. Through the application, you can keep the clock time your cell phone’s always assimilated to, in addition to choosing a spindle between other 400 cities around the world so that it is constantly displayed on the secondary display device. In the application, you can switch the time displayed in the primary and secondary pointers quickly, a role that surely will please anyone who travels a lot for cities spread across different time zones. Accessing other app tabs, it is also possible to schedule the appointment for the alarm rings on the clock, as well as give guides to use the EQB-510 and hit the placement of pointers. The most interesting functionality that arises from the relationship between the smartphone and the clock is controlled directly from the EQB-510 and is only possible when the two are disconnected, but have already been connected before. In this kind of situation, just hold the lower right button for about 5 seconds to make the cell phone issue loud noises, allowing you to find easily. The function is certainly quite interesting to people who tend to forget where the House left your smartphone, but it takes some caveats. In our tests, the feature worked well at a distance of up to 10 meters between the phone and the EQB-510, but since there were many obstacles between the two. When we tried to raise the resource in separate rooms or with many obstacles-like multiple computers linked, for example, the distance has been reduced drastically. In this way, the function will hardly be useful to find your smartphone if it’s not in their immediate surroundings. Constructed with a rigid structure – and quite heavy-metal, the EQB-510 was also made with durability in mind. In addition to endure quietly common daily use and impacts small accidental falls, the device was designed to withstand up to 100 meters of water, so that you don’t have to worry when wet. Speaking of concern, another aspect of the clock that was done so that the user never has to warm the head is your battery. With the Tough Solar Power technology, the device can recharge your energies to be exposed to any kind of light, be it solar, incandescent or fluorescent. Once loaded, the device continues working for up to 34 months, even if it is kept totally in the dark. The EQB-510 is available for purchase through specialized resellers, like watch shops and jewelry stores. In total, the Casio Edifice has no less than 1,745 authorized points of sale spread throughout the Brazil-and you can check your addresses by clicking here. If you find that the suggested retail price of R$ 2,989 is too expensive, you can find merchants asking for lower values on platforms like the Free Market. When we consider the countless options of smartwatches full of features that are already on the market, it’s not even need to take the price of the Casio Edifice Time Traveller EQB-510 in noting that he was not made for the general public. With your exquisite visual, high value and focus on international travelers, the clock has been designed specifically for those who want to join the classic style of an analog device with the convenience of modern facilities. Because the device does not have any type of digital display itself, it was expected that the smart functions were limited. Still, it is a fact that it wouldn’t be impossible to add an extra mode allowing control music on your smartphone, take pictures or start and pause the recording of videos. Another disappointment came from the short range of the function “find my phone”, which decreases enough your usefulness. On the other hand, it is undeniable that the clock brings functions that will be of great value for anyone who travels a lot and don’t want to worry about the durability and the battery from the appliance. You can adjust the schedule with just a few moments in the app for smartphone facilitates a lot of things in time to change time zone, and a virtually infinite battery certainly is something that no one would complain.